With fixed income and bonds the menu consists of the following: corporate, high yield, municipal, emerging market, government, international government, inflation-protected, mortgage-backed and preferred stock. Many institutional investors (insurance companies and large pension plans) must have an allocation to bonds. Many asset allocation plans include bonds for individual investors. And, clearly savers and seniors especially gravitate to them for safety and income. We’ll be evaluating most of these issues and sectors beginning with corporate bonds. While we haven’t included all that are available, we’ve sorted the top ten below by AUM (Assets under Management). It doesn’t mean we favor one over another and perhaps newer issues might even have better features but haven’t been seasoned enough to garner significant assets yet. Corporate bond yields range from 2-4% overall. Investors should remember most corporate bond issues have call dates which would mandate early redemption at the option of the issuer. These can limit capital appreciation. Corporate bond supply is quite plentiful given low yields. This has made it compelling for companies to take advantage low cost funding for many purposes including stock buy-backs and rebuilding balance sheets. Typically most bond issues and sectors aren’t highly correlated to stocks. This was especially true during the previous bear market. However, recently given unusual Fed policies combining ZIRP (Zero Interest Rate Policies) with QE (Quantitative Easing) these non-correlations have become less apparent. This may prove temporary. iShares iBoxx Investment Grade Bond ETF (NYSE:LQD) tracks the iBoxx Liquid Investment Grade Index comprising over 600 bond issues. The fund was launched in July 2002. AUM (Assets under Management) is $13 billion and daily trading volume averages just under 1M shares. Over 70% of constituent holdings have maturities between 3-10 years. This would be considered moderate and offers less duration risk. As of mid-September 2011, the annual dividend is $.43 making the current yield 1.53% with YTD 4.05%. 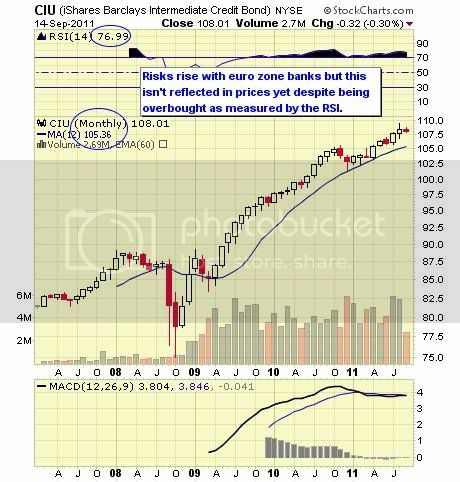 Beware that over 50% of holdings are in the financial sector dominated by banks including those in Europe. iShares 1-3 Year Credit Bond ETF (NYSE:CSJ) tracks the Barclays Capital U.S. 1-3 year Credit Bond Index which includes corporate and sovereign debt and non-U.S. agency bonds. The bonds held are shorter-term in duration clearly virtually eliminating duration risk. Bonds within the holdings are all investment grade. AUM is over $8 billion and trading volume averages over 475K shares daily. YTD market return through May 2011 has been 1.18% while the yield is roughly 2.29%. 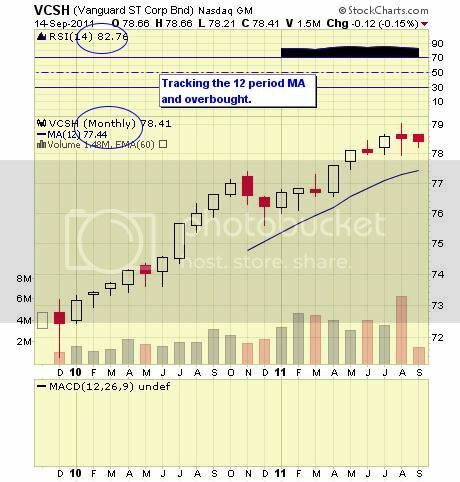 iShares Barclays Intermediate Bond ETF (NYSE:CIU) follows the Barclays Intermediate Credit Bond Fund Profile which consists of investment grade bonds with maturities of greater than one year but less than 10 years. CIU has AUM of roughly $3.4 billion with average daily trading volume of just less than 200K shares. CIU has a yield of approximately 4% and has returned 2.55% through May 2011. Vanguard Short-term Corporate Bond ETF (NYSE:VCSH) also tracks the Barclays Capital U.S. 1-5 Year Corporate Index which includes U.S. dollar-denominated, investment-grade securities. Vanguard in general would like to compete with similar offerings based on lower fees. And, if you’re an investor with a long-term investment horizon and with interest rates this low, fees could matter. VCSH’s expense ratio of .15% versus .20% for other similar products is possibly more appealing. AUM equal $1.5 billion and average daily trading volume is roughly 160K shares. Through May 2011 YTD return has been 1.79% with a yield of 2.33%. iShares Barclays Credit Bond ETF (NYSE:CFT) follows the Barclays Credit Bond Index which includes dollar denominated corporate and agency debt and have maturities greater than one year. In the top ten holdings you’ll note a mix between dollar denominated overseas issues and even a municipal bond issue. AUM is $862M and average daily trading volume is roughly 54K shares. Nearly 75% of current maturities are within 10-years. The annual expense ratio is .20%. Through May 2011 CFT has returned 2.98% with a yield of 4.42%. Vanguard Intermediate Term-Corporate Bond ETF (NYSE:VCIT) tracks the Barclays Capital U.S. 5-10 Year Corporate Bond Index. AUM equal $518M while daily trading volume averages roughly 65K shares. Typical of Vanguard’s fee structure is a .15% expense ratio. 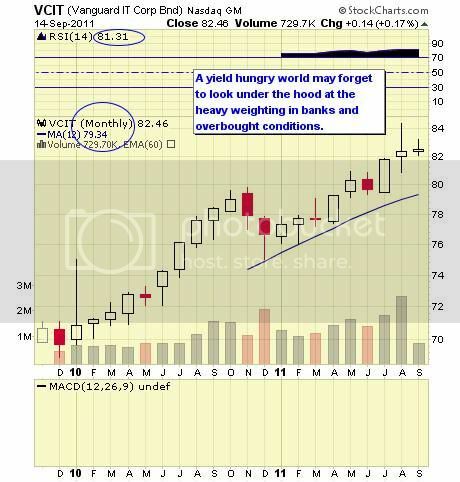 Through May 2011 VCIT has returned 3.45% with a yield of 4.17%. SPDR Barclays Capital Short-Term Bond ETF (NYSE:SCPB) follows the Barclays Capital U.S. 1-3 Year Corporate Bond Index. AUM equal $360M while average daily trading volume is around 94K shares. For investors not wishing to pay higher fees, SCPB has a low expense ratio of only .12% which doesn’t eat away too much of already low yields. 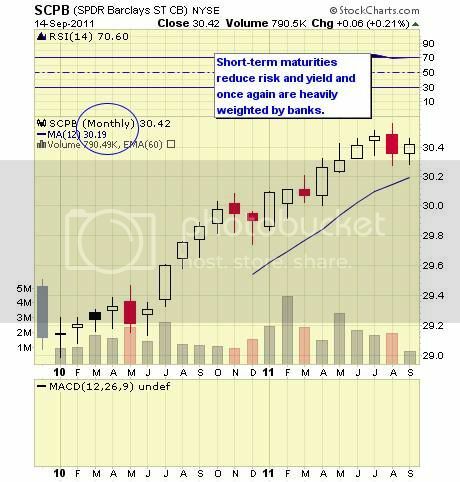 Through May 2011 SCPB has returned 1.21% and has a current yield of 1.87%. SPDR Barclays Capital Intermediate-Term Bond ETF (NYSE:ITR) tracks the Barclays Capital Intermediate U.S. Corporate Index. The index includes dollar denominated debt from U.S. and non-U.S. industrial utility and financial institutions with less than 10 year durations. AUM equals $183M and the average daily trading volume is roughly 37K shares. The expense ratio is .15%. Vanguard Long-Term Corporate Bond ETF (NYSE:VCLT) tracks the Barclays Capital U.S. Long Corporate Index which is investment grade, dollar denominated with maturities greater than 10 years. AUM equal $104M and average daily trading volume is roughly 13K shares. Typical for Vanguard the expense ratio is a low .15%. 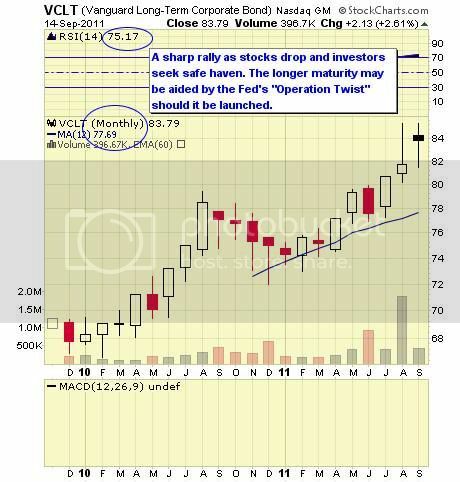 Through May 2011 VCLT has returned 2.95% and has a current yield of 5.34%. PIMCO Investment Grade Corporate Bond ETF (NYSE:CORP) tracks the Bank of America/Merrill Lynch U.S. Corporate Index with dollar denominated investment grade issues with maturities greater than one year. CORP is a relatively new issue (September 2010) and has AUM of $83M with average daily trading volume of around 6K shares. The expense ratio is .20%. 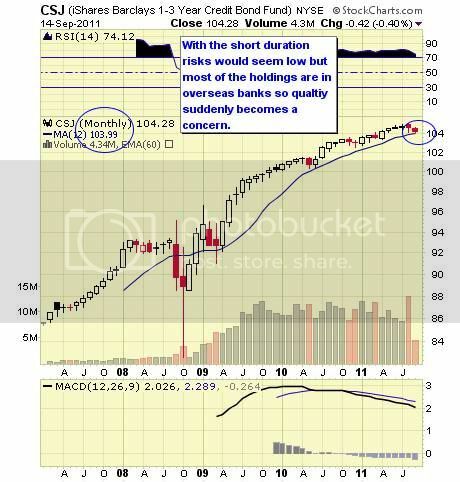 A feature is CORP rebalances its holdings monthly which should be a tax consideration for some investors. Holdings for CORP are unavailable at this time. 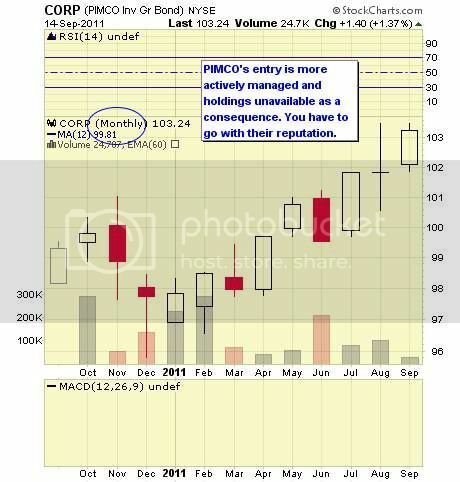 Through May 2011 has returned 1.72% and per PIMCO’s website the current 30 day yield is 3.57%. The choices for investors looking for safer returns with higher yields away from Treasury bonds generally will turn to investment grade corporate bonds first. The list is long and sometimes quite repetitive as components vary little one to another. The real choice here is maturity selection or what duration risk are you willing to assume? The longer out the curve you go the greater the return and risk to principal. As a former bond principal I worry about price risks now as most sectors are overbought, offer negative yields and have too much exposure to bank risks. It may be I suffer from the “the more you know about something, the less you like it” syndrome. Nevertheless, yields are skimpy and risks from budding inflation high with longer maturities. With shorter maturities you do little better than yields from the bank after headline inflation. 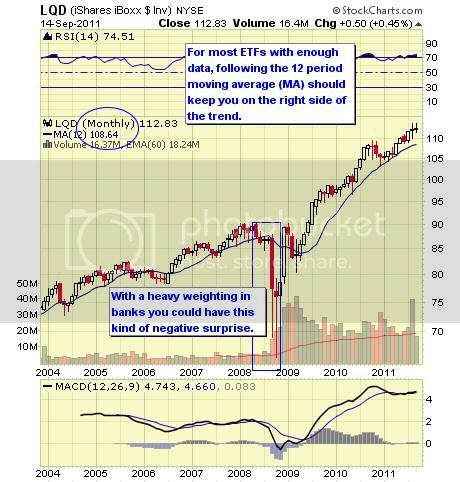 So, given the environment with many uncertainties “cash” from money market funds and/or T-Bills is just fine for now. Remember, many institutions (insurance companies, pension plans and many asset allocation models) call for large bond allocations. Some insurance companies may only own bonds given their actuarial table requirements. If you’re an individual investor you’re not under the same pressures no matter what you hear in the media. Further previous non-correlations of bonds to stocks for example have been whittled away given current monetary policies of the Fed. This only adds to risks already mentioned. 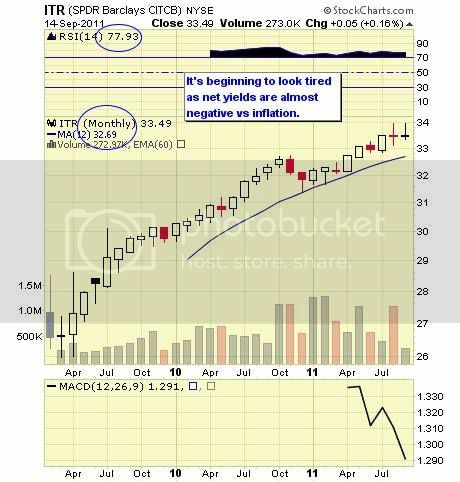 If you must buy them, our bias generally is to more liquid issues unless we utilize them in Lazy portfolio approaches. Just always remember ETF sponsors must issue and many times their interests aren’t aligned with yours. They have a business interest and wish to have a competitive presence in any popular sector. 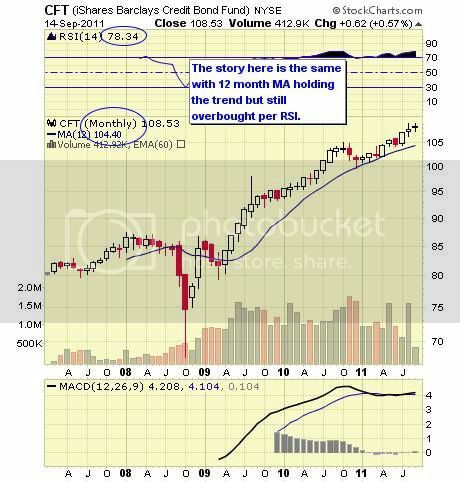 For further information about portfolio structures using retail or other ETFs find more here. David is founder and publisher of ETF Digest and best selling book author of Create Your Own ETF Hedge Fund, A DIY Strategy for Private Wealth Management published by Wiley Finance in 2008. In July of 2009, Fry was named in the ETF Hall of Fame as one of the Top 25 people who revolutionized the ETF industry and guided ETF investing from its conception to widespread acceptance among all breeds of investors. Fry founded the ETF Digest in 2001 and was among the very first to see the need for an online publication that provided individual investors and financial professionals with trading tools, market information and actionable advice on ETF investing. ETF Digest was recently ranked 9th in the Top 100 ETF websites from Alexa on exchange traded funds. Dave Fry has devoted over 35 years to the business of trading and portfolio management. He is registered as an arbitrator with the Financial Industry Regulatory Authority (FINRA) and the National Futures Association (NFA).